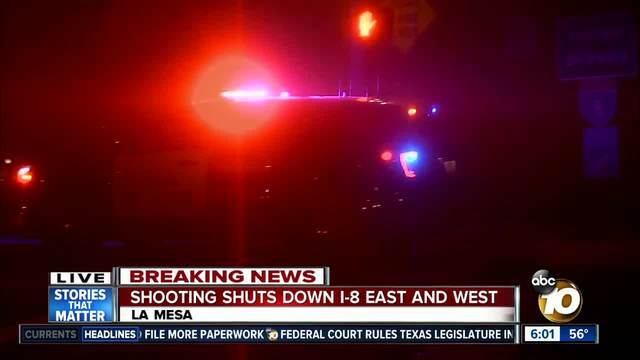 LA MESA, Calif.— California Highway Patrol called an early Sunday morning freeway shooting on Interstate 8 that left one man in the hospital with a bullet wound "random." An Infiniti carrying four young adults was sprayed with bullets while traveling eastbound on I-8 near Fletcher Parkway. The victims had been traveling on the freeway when they stopped at a Denny's restaurant off I-8 and 70th Street to attend to a window stuck in the down position, according to CHP. When they got back on the freeway around 4:00 a.m. the 20-year-old male driver from San Diego said he heard a thump and thought it was a blown-out tire. In fact, his friend, a 20-year-old man from Lancaster who had been sitting in the rear right passenger seat, was shot in the right shoulder. He has been transported to the hospital with non- life threatening injuries. "At this time, an unknown type vehicle pulled up alongside in the #2 lane. An occupant or occupants from the vehicle opened fire on the Infiniti with a minimum of 5 rounds being discharged," according to a CHP statement. Two female passengers and the driver were uninjured. The driver swerved to the left and struck the center divider. 10News reporter Grecia Aguilar found a vehicle with two bullet holes through the passenger door and two through the window being towed away on southbound 125 at Lemon Avenue. California Highway Patrol shut down both sides of the freeway near Jackson Drive to search for shell casings but reopened all lanes by 7:30 a.m.
Investigators are asking anyone with information to please contact CHP at 619-401-2000.